Andy Paddock P.E. URS Corp. The Courtyard House is a pre-fabricated, single-family residence, designed and built in Fayetteville, AR, by students, and then installed in the South Main neighborhood in downtown Little Rock, AR. The house is composed of 5 sections. 4 of the sections are 14’ x 20’. These 4 modules are the main interior spaces of the house: master bedroom, living space, kitchen/dinning, and second bedroom. The 5th section, the courtyard, was built on site and is the focal point of the project. The overall dimensions of the house are 20’ x 72’. The courtyard is 16’ x 16’ and is concealed by the envelope of the building. The courtyard is in between the living space and master bedroom of the house, and the kitchen and living space are one single space. The courtyard is enclosed on three sides by floor to ceiling glass and open to the sky. From the interior, one is able to see from the kitchen, through the courtyard, and into the master bedroom. 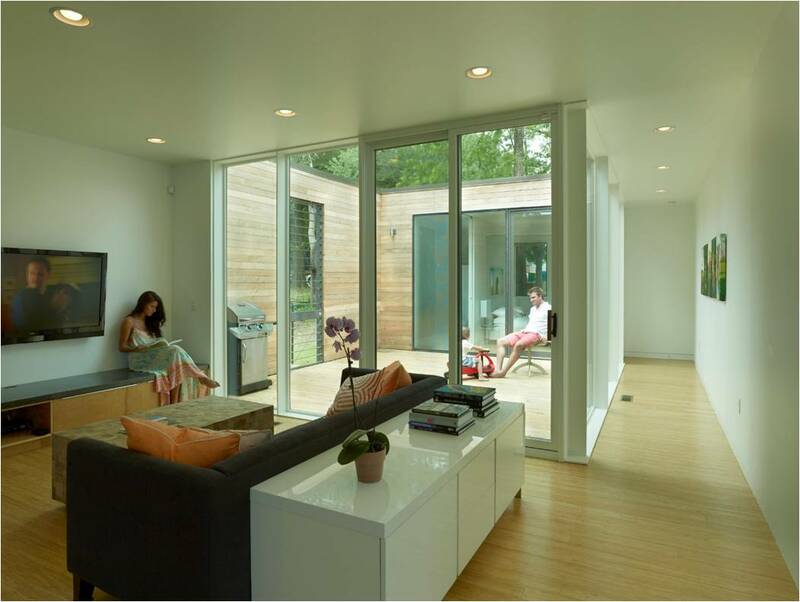 Both the living space and master bedroom open onto the courtyard allowing ample natural light deep into the spaces.